Wasps taking over your boat? If your boat has been undercover over the winter, there’s a good chance that when you come to spruce it up for the summer, there’s quite a collection of creepy crawlies on it who’ve decided to take up residence while you’ve been away. You’ll need a good inspect spray to deal with wasps nests that may be hard to get to. 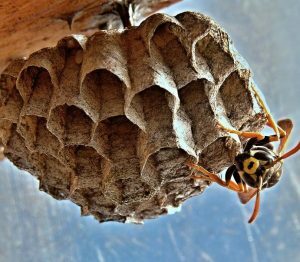 Although you might not be deterred by most of them, a sizeable wasps nest can create quite a buzz (sorry!) if you disturb it. Unlike bees, wasps are tenacious little buggers and won’t give up once they’ve managed to inject you with venom the first time. A bee will roll over and die, knowing that it has protected it’s hive. A wasp, on the other hand, will continue to sting you as long as it can get to you and then go home to it’s nest expecting a medal for it’s efforts! Be wary when removing boat covers, opening hatches, moving trailers and digging out all your boating gear. Paper wasps love a good sheltered tarpaulin or boat shed under which to build a nest that can quickly grow from the size of a golf ball with a few wasps to a large colony containing thousands of yellow and black so and so’s that will happily ruin your day. Don’t try and tackle an active nest up close as they can swarm and attack you all at once. It’s best to be able to handle it from a distance of at least a couple of metres so they are not sure where the attack is coming from. Most sprays won’t allow you to stand this far away but Wasp-X will shoot out a jet of foam up to 5 metres that will coat the wasps and the nest and knock the whole lot down in seconds. Moreover, any wasps returning to the nest will also die on contact with the foam. We’ve found that this wasp spray is also great for killing of other unwanted bugs, such as flies and cockroaches and forms a long-lasting barrier that will kill on contact over an extended period of time. You can buy Wasp-X online here (free shipping nationwide!) or you can find it in most Palmer’s Garden centres throughout New Zealand. Which Marine Reserves Can You Fish At? Which Marine Reserves Are Best for Scuba Diving? Which Marine Reserves Are Best for Kayaking?